I cannot even begin to imagine the terror and suffering endured by the thousands of children suffering during the Holocaust and World War II. When my eight year old son was watching a documentary on the history channel with his father he asked us to explain to him what had happened. I struggled with how to explain this to my innocent child who was not aware that such a horrible atrocity had happened in the past. Odette’s Secrets, a Holocaust Novel by Maryann Macdonald is a powerful story for children that will introduce young readers ages 10 and up to the holocaust in a more gentle way that will be impactful but less frightening. It is the true story of Odette Meyers who became a poet and university professor after she escaped from Paris to the French countryside as a young child during the holocaust. Here she must hide her Jewish heritage and even attend Catholic mass with the other children leading her to struggle with forced secrets and inner turmoil. She learns to hide her identity in order to remain safe but when the war is over, she and her mother will return home to Paris and Odette will begin to rediscover who she really is. Even though my son is only eight, I decided to read this book with him to help answer some of his questions. For me, this book is like a work of art as it is written as free-verse poetry and it beautifully captures the young girl’s courageous, innocent spirit that deals with issues no person should ever have to endure or experience especially at such a young age. This book is impactful and moving and in fact there were times that my son became tearful during the story but it was never frightening to him. 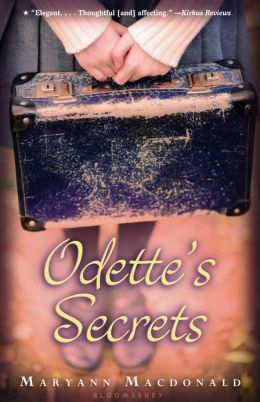 Odette’s Secrets, a Holocaust Novel opened up the door to history to him in a way that he could understand. I will definitely keep this book for when my younger two children will be able to understand the story of one brave girl among thousands of children of WWII, Odette Meyers! I now this is a childrens’ book but it is scary how many adults do not really know what the Holocaust was all about (thank you American teaching system!!). This seems like it would be a good book for them to read as well. Sounds like an interesting read especially for the younger ones. Truly a tragic and horrible time in world history. This book sounds amazingly moving and I love the way you say its written. I will definitely have to check this out! This book sounds wonderful and I would love to read it to my grandchildren to help them understand the Holocaust. Children need to understand about the Holocaust. Even though there are survivors left, there are many (IGNORANT, PREJUDICED) people who claim it never happened. I’m not sure (besides anti-Semitism) what their motivation is in such a claim, but I would counter with this, were I THAT stupid: “Oh, well, slavery never happened, either”. What a very interesting book to read to older children. I am always sad when I hear what happened to all the Jewish people during the Holocaust! This book can help to show what they went through! I want to read this person’s journey. I think this is a great introduction to the holocaust for children. Many people don’t realized what happened back then. Sounds like it is a good book to help educate older kids about the holocaust. Another story that I’m glad was told. I remember Sarah’s Key as well. Even with all the horrible things that are happening in todays world . It is always hard to try to tell or teach a child about a past event like this. If this book educates them in a way that they can understand thats good. Sounds like a moving account from a special perspective! I would definitely read this book with my girls. Thanks for the recommendation. That sounds like a great book. Thanks for the recommendation!